Camakau (Fijian pronunciation: [ða ma kau]) are a traditional watercraft of Fiji. 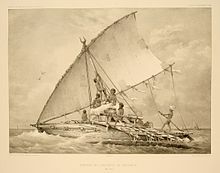 Part of the broader Austronesian tradition, they are similar to catamarans, outrigger canoes, or smaller versions of the drua, but are larger than a takia. ^ Randy Thomas (1984). "Bluewater Odyssey". Yachting. Retrieved 6 January 2015. This page was last edited on 23 August 2018, at 19:30 (UTC).